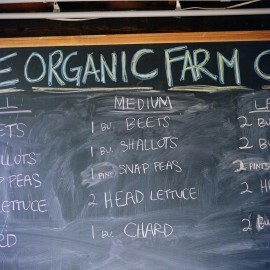 Cure Organic Farm, located just six miles east of downtown Boulder, Colorado, is one of the first and most successful farms to supply local chefs with fresh produce. This season, Cure has a sold out CSA (community supported agriculture) program, sold out kids’ summer camps June-August, and a robust business at the Boulder Farmer’s Market and at their farm store. The community adores Anne and Paul Cure. Their business is thriving. But a lot of farms haven’t been so lucky in the last five to ten years. Even with rising demand from hungry foodies and eco-minded eaters, small organic farms in Northern Colorado are going out of business left and right. So what’s their secret? Is it just luck? What are the Cures doing differently? In a nutshell, they are extremely specific about who they serve, how they serve them, and why. They’ve got big hearts but a small target market. “We aren’t trying to feed the world, we just want to produce great food for the people around 75th and Valmont in Boulder, to connect them to the land where it’s grown,” co-owner Paul Cure told me. They know what motivates their customers, why they keep buying. In part, it’s the story behind their food. “People are really hungry for that narrative,” reflects Paul. Why don’t ALL small-to-medium size businesses do so well with their targets? Often we small-to-medium size businesses fail to narrow our target audience enough. Instead, we broadcast a broad (yep, bland!) message in hopes that more people will hear us. We don’t want to leave anyone out … you know, just in case someone on our periphery happens to be interested. What if we alienated a potential customer? Here’s the truth: You can’t please everyone in the room. Heck, you can’t even talk to everyone in the room. Think about a recent networking event. Did you talk to more than a few people? How draining was it to talk to an incompatible bore? How amazing did it feel to really connect with one single person who really got what you have to offer? But there’s more, from a psychological perspective. A broad and bland approach can seriously hurt your conviction in your business’s value. When we lose sight of that, we certainly can’t sell effectively. I know this has been true for my business. Starting out, I was terrified to narrow my focus. I also needed experience working with a variety of clients to know who truly needed my services — and where I was most effective. I had to get over a big desire to please everyone. And I had to develop the cajones to say “no” to some of the more obvious target markets. Now, I have two highly specific target markets; I know how to serve the individuals in these markets, what value my business holds for them, and why they resonate with my marketing. It has made a HUGE difference in my sales. How about you? Have you found greater success by narrowing your focus? How could your target market be even more specific? Feeling generous? Share your thoughts in the comments below.